John Leonard, former literary editor of The Nation, died November 6 at 69. From the archives, his iconic piece on Toni Morrison's Nobel Prize win, in his honor. 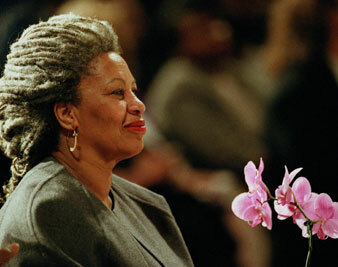 Toni Morrison at the Cathedral of St. John the Divine in New York, April 5, 1994. Author and critic John Leonard died November 6 at 69. He will be missed by all who love literature, especially here at The Nation, where he was literary co-editor with Sue Leonard from 1995 to 1998. In this 1994 piece, he chronicles Toni Morrison’s journey to Stockhold to receive the Nobel Prize for literature. Well, since she asked, why not? I left town for Greek light, German sausage, Russian soul, French sauce, Spanish bull, Zen jokes, the Heart of Darkness and the Blood of the Lamb. Toni Morrison’s butter cakes and baby ghosts, her blade of blackbirds and her graveyard loves, her Not Doctor Street and No Mercy Hospital and all those maple syrup men “with the long-distance eyes” are a whole lot more transfiguring. Where else but Stockholm, even if she does seem to have been promiscuous with her invitations. I mean, she asked Bill Clinton, too, whose inaugural she had attended, and with whom she was intimate at a White House dinner party in March. (He told Toni’s agent, Amanda “Binky” Urban, that he really wanted to go but… they wouldn’t let him.) Salman Rushdie might also have gone except that the Swedish Academy declined officially to endorse him in his martyrdom, after which gutlessness three of the obligatory eighteen academicians resigned in protest, and can’t be replaced, because you must die in your Stockholm saddle. That neither of these imperial egos made the trip was a relief to some of us. It should have been Morrison’s occasion and nobody else’s, except maybe ours. While international capital flew in one direction and refugees moved reciprocally in the other, opposite, some of us dwelt among author-gods. Toni was Cleopatra, and Stockholm was her barge. On the other hand, what were we–sons, sisters, nieces, cousins; editors, agents, critics; professors from Princeton, Harvard and City College; well-wishers, witnesses, celebrants, pilgrims, support-groupies, friends–Sgt. Pepper’s Not-So-Lonely Hearts Club Band? Perhaps The Boys (and Girls) in the Bus. Or, more grandly, Canterbury Tale-Tellers, canzone-singing Boccaccio-type fugitives from plague-stricken Florence, Greek mercenaries out of Xenophon’s Anabasis fighting their way back from Babylon to the Black Sea, the 108 bandit-heroes of The Water Margin (that Chinese Robin Hood, Chairman Mao’s favorite book), the courthopping Christian humanists of Marguerite of Navarre’s Heptameron, and maybe, too, the Buddhists who trooped with Tripitaka on his Journey to the West to bring back the Sutras from India, in which case Fran Lebowitz was clearly Stockholm’s equivalent of Hanuman the Monkey King, the shape-changing Trickster who so annoyed Lao-tse by eating the Peaches of Immortality. Some had collapsed in a heap, fast asleep, in the middle of their dances and were lying as though struck by a bolt of lightning, their hair and headdresses in disarray, amid their scattered garments; others had flung their garlands to the floor, and with the strings of their necklaces broken, their belt buckles unfastened, their skirts thrown back, looked like unsaddled mates; still others, having lost their bracelets and earrings, with their tunics torn to shreds and trampled underfoot, had the appearance of climbing vines trod upon by wild elephants. Aside from the sexism, this passage perfectly captures that combination of jet lag, culture shock, party favors and giddy pomp so characteristic of all the Morrison camp-followers for a whole week of long winter nights. The sun, when there was any, came up at a quarter to nine in the morning and went down at quarter to three in the afternoon, and so far as Fran Lebowitz was concerned, misapportioned itself: Sunshine should always start at six at night, when she really needs it. But the electric light in this northern Venice is lavishly lunar in black waters, sneaks sideways off surfaces of gray and yellow the pale cast of thought, decocts castles and rococo. Nor did so many dark hours detain for a moment Wole Soyinka from his quest for Chinese food and all the souvenirs he had forgotten to bring back for his children in 1986, when he won his Nobel Prize. Or prevent Henry Louis Gates Jr. from jumping ship on Wednesday to Prague, for a forty-five-minute one-on-one with Vaclav Havel. Or slop Toni’s son Ford from gabbing on the cellular phone of his mother’s Volvo limo to a young Swedish woman he hadn’t seen for twenty years. Or stay Errol McDonald, the editor from Pantheon, from singing Smokey Robinson in the bar of the Grand Hotel. Our Nobelette arrived in Stockholm Monday morning overnight from Newark, to face at the airport, full of champagne, Novocain and sleeplessness, the first of dozens of press conferences. In a language not quite English, she was asked whether her winning such a prize would “improve racism” in the United States. No, she said: “I don’t think it has any enormous impact on the way ordinary people feel, or the way politics runs its course.” Later, she’d riff on what she might have said instead: Improve racism? Of course not; it’s perfect as it is. Or: “You’re the doctor; I’m the patient.” Or: “Maybe we could change the colors to pink and blue.” But that was after a nap in her room at the Grand, and fluffing up her Bill Blass ballgown. I have decided not to talk about the killer shoes. When I said later in the week that I’d heard more in Stockholm about shoes than about literature, Claudia Brodsky, the Barbarella/ Linda Ronstadt of Princeton deconstruction, began immediately to babble about Absalom, Absalom! This of course was transparent. But then our Nobelette went off to the first of her laureates-only flings, while some of the rest of us ate peanuts with Jerome Brooks of City College. Brooks was in Stockholm because Toni’s prize seemed to vindicate the lifetime he had spent campaigning to include black writers in American literature. (As I was there because I’ve been reviewing Toni for twenty-three years. As Soyinka was there because he’s been lobbying for her ever since his own Stockholm triumph. As Gates was there not only in solidarity but because Soyinka had been the teaching assistant who’d changed his life in graduate school at Harvard. It is amazing, isn’t it, that we eat sushi and Mex, falafel and pizza, shish kebab and moussaka and Chinese takeout, Polish ham, Alaskan salmon, Jerusalem artichokes, salsas and chutneys, yet find it hard to imagine that literature could possibly be other than Wonder Bread; that there are whole grains of genius out there if you’re really hungry for meaning.) On the subject of City College, Brooks would rather dwell on Chinua Achebe than fend off Leonard Jeffries questions. About shoes, he’d nothing at all to say, although he’d brought his own white tie and tails for the banquet, while the rest of us had still to find our way to Dahiquist’s on KommendOrsgatan for a final fitting. Either you wear a formal tux to meet King Carl XVI Gustaf or you dress up in “national costume,” which was easy enough for Soyinka because he’d brought with him from Nigeria a dazzling dashiki. But I’d look odd as a blue-faced Druid, speaking the tribal Ogham. The peculiar rustling was of pages. Her text had been made available in advance, and as she spoke the audience followed her words. I thought this unfortunately distracting. Lebowitz, persuasively, disagreed. Imagine: You’ve written these marvelous words, and now you’re showing everybody exactly how they ought to sound. There was something almost medieval about it, as if like monks we sang her illuminated manuscript. Anyway, for the first time in the memory of the Foreign Ministry, the audience, unable to help itself, stood for a second standing ovation. Well, many of us have bitched for years about the Swedish Academy and its vagrant enthusiasm for the likes of Erik Axel Karlfeldt, Frans Eemil Sillanpåäa and Pearl Buck, while first Nabokov and then Borges died unprized. In Earwitness, his catalogue of monomaniacs, the humorless and woman-bashing Bulgarian Elias Canetti (Literature Prize, 1981) included Corpse-Skulkers, Narrow Smellers and Woe Administrators. I’d always imagined the academicians as Narrow Smellers, until they suddenly started handing out theft prizes to Montale, Bellow, Singer, Milosz, García Márquez, Soyinka, Paz and Gordimer. (Never mind William Golding; he did less damage to literature than Henry Kissinger did to peace.) Now, gloriously, this. Toni went off with these academicians, to dine on the partridge one of them had shot (while also shooting, by accident he said, another of the academicians), and to be valorized by all the others, including an eminent art critic who used to play jazz in his youth with Charlie Parker and Lester Young. But there were some of the rest of us–the laureate’s Princeton assistant, Rend Shepperd, and her architect husband, Dan; the laureate’s lawyer, Fritz Cammerzell; Fran Lebowitz, only ten years late on her novel, chain-smoking and chain-joking–on the Old Town streets of Janla Stan, making faces at the Stock Exchange and the big square Slottet, ancient Storkyrkan and bloody Stortorget. We would meet the laureate later that night. She would show us the brand-new Swedish postage stamp with her face on it, better than Elvis. Meanwhile, eating Bambi in the dungeon of Stockholm’ s oldest restaurant, we swapped stories about her. I have twenty-five years of stories, but I hadn’t known that this mother of two sons was still excusing Mike Tyson’s behavior. Or about the Menendez brothers. Or about her new novel, Paradise. Or about the scam she pulled with Lebowitz on an English reporter. They knew this reporter would ask what she intended to do with her $825,000 in prize money. By prearrangement, Toni said she would go to Somalia and mount, in Mogadishu, a stage production of The Emperor Jones. At the Cafe Opera late Tuesday night, where Fran decides that Swedes are “spontaneity-impaired”; at the lunch for Toni given by her Swedish publishers on Wednesday, where singers in eighteenth-century playsuits entertain with raunchy ballads by the pub-crawling poet Carl Michael Bellman (See how the nymph comes springing/And fondly sweats with busy air); at the concert hall Wednesday night, where, after quite a lot of Wilhelm Stenhammer’s Symphony No. 2 in C minor (Op. 34), Barbara Hendricks will sing Berlioz better than he’s ever been sung before; in the lobby and the bar of the Grand Hotel on Thursday, as the infantry from Knopf arrives, the two-fisted, expense-account drinkers of aquavits with Pilsner chasers, and at the academy reception later that night, where, before all the Princetonians disappear for some Masonic Tiger-rag, we meet Toni’s sister and nieces, her French and English publishers, and the ex-wives and the younger mistresses of the Nobel-winning scientists; at breakfast Friday morning, after Fran has jogged while Comel West hasn’t, and at lunch, where Skip Gates, Richard Sennett and Errol McDonald deconstruct Geoffrey Hartman and Harold Bloom, and in the afternoon before the chartered buses leave for the prize presentation ceremonies, while all the men trying to dress up like emperor penguins rediscover the reason why either wives or servants are necessary for civilization; as Barbara Hendricks comes back to sing, just before the enNobeling of Morrison, an astonishing “Summertime” (fish are jumpin’ an’ the cotton is high) after which the laureate refuses to clap–something is happening to all of us, a splendid inflation, a kind of surfing. Like Hanuman, we expand, so that the she-demon sea-monster Suras must elongate her mouth. And then we shrink to the size of a thumb and shoot right out through one of her ears. We hallucinate. Much much later with Knopf poobah Sonny Mehta in the bar, we will remember the National Book Award that Toni didn’t get for Beloved, in the Grand Ballroom of the Pierre Hotel in New York, after the pasta and pine nuts, the rare roast beef as thick as your foot, the lemon, soufflé and the William Gass, while we stuck burning leaves into our food-holes and I thought at the time of the Russian revolutionary novelist Andrei Bely: Rolling toward them down the street were many-thousand swarms of bowlers. Rolling toward them were top hats, and froth of ostrich feathers…. Alexander Ivanovich tore himself away from the contemplation of noses. Not error, but charlatanism of the vilest kind is at work here…. An impermissible mockery…made up of gossip and phantoms. I’d later get a letter from Toni: “Feeling that my sweet Paul D had been trashed, that Sethe was back in the barn, I finally saw the color Baby Suggs never got around to: red?’ And she quoted “the greatest blues line ever written”: Lady, your husband is cheating on us. Such a redress of grievance had been unimaginable back in 1987. Jerome Brooks himself had been one of the signatories to a letter of protest from forty-eight African-American writers and critics. All of us took Beloved personally; its career in the world mattered more to us than our own, like a favorite child. Morrison, as Cornel West would say before we finally went to bed in Stockholm, had “shattered black invisibility?’ Out of the gospel of the Middle Passage, the blues of slavery, the jazz of big-city ghetto nights, mother-wit and children’s riddle, she had made radiant world literature. So here we are–after snowflakes, joy rides, candle flames, singing waiters; after the trumpets, madrigals and reindeer, the black velvet, the silver scepter and the golden spoons–and how does it feel? As if, for dessert, they’d served us the Peaches of Immortality. As Toni’s metaphors Tuesday rose and converged on the vaulted ceiling, so,too, on Friday night in City Hall did her admirers, like the dervishes of Sufi and the angels of Chagall. What happened before we sat was a trumpet fanfare and a processional. Leading this procession, descending the marble stairs on the arm of the King of Sweden, was our Nobelette. And there’s never been such majesty. I wasn’t the only wet-eyed New York smarty-pants proud to be a citizen of whatever country Toni Morrison comes from.